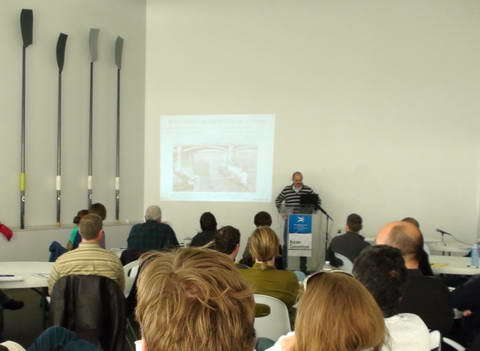 The best way to be introduced to rowing biomechanics is to make use of BioRow's services. 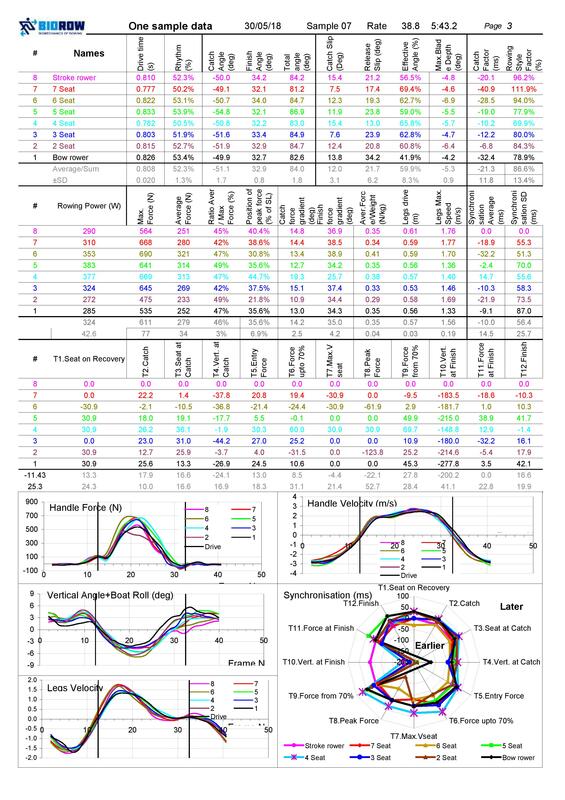 We possess special instrumentation to measure the most informative variables of rowing biomechanics: force and power production, blade work, boat mechanics, body segment sequencing (rowing style) and synchronisation in a crew, as well as the basic rowing measurments such as speed and stroke rate. Numbers mean nothing without sufficient knowledge and adequate analysis. This is our core strength: we know exactly what we measure, what it means and how it is related to the efficiency and effectiveness of your rowing technique. 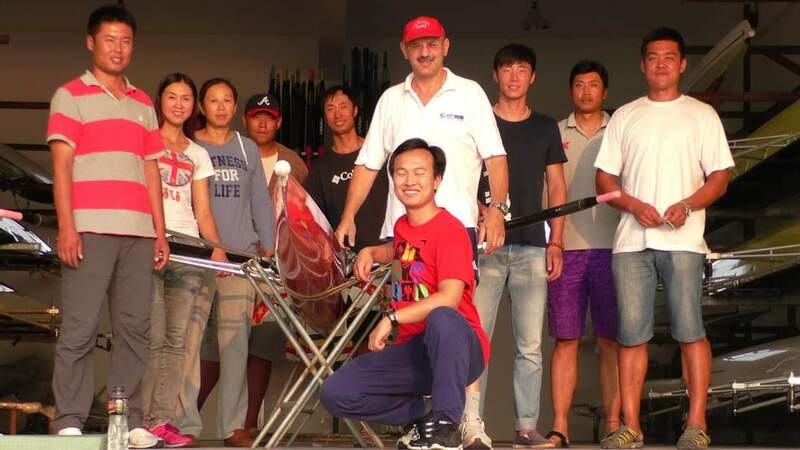 For 25 years, we have measured and analysed data from several thousands of rowers and crews all around the world, many of whom were Olympic and World champions. 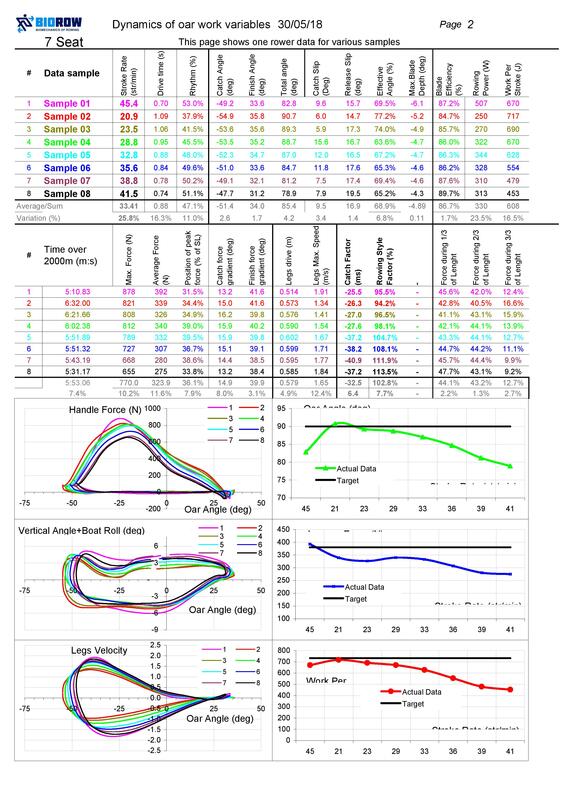 We have learned a lot from these phenomenal athletes, and built biomechanical models as well as effective algorithms for data evaluation and feedback. Now this vast knowledge can help you to improve your technique and performance. 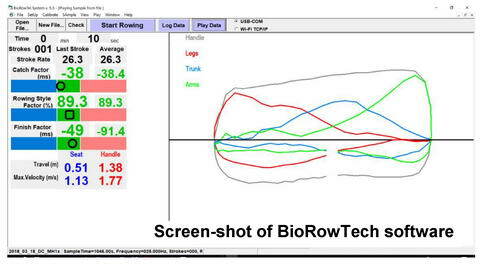 The most well-known service provided by BioRow is the biomechanical rowing analysis done using the BioRowTel system, which can be a useful tool for crews of all abilities - from juniors to elites to masters. 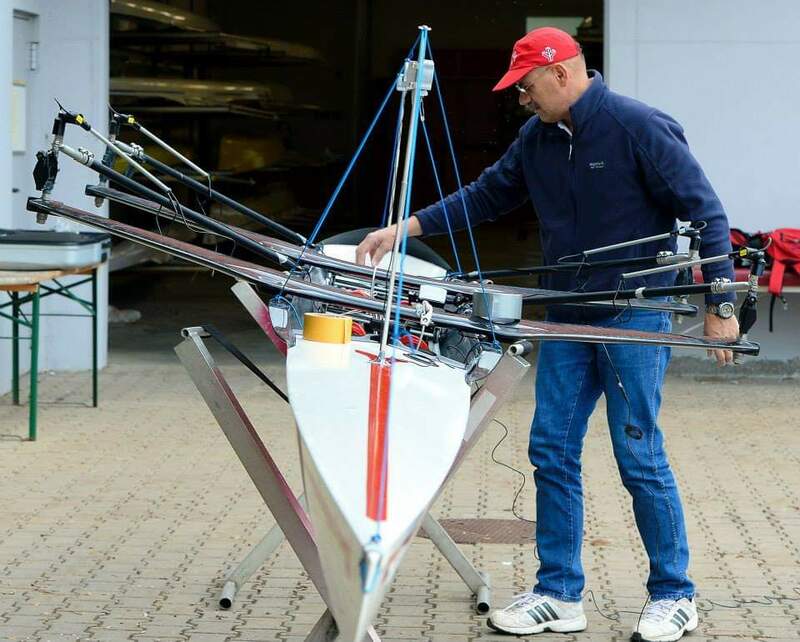 The system provides in-depth analysis of rowing technique and speed, by means of making several accurate and sophisticated measurements. 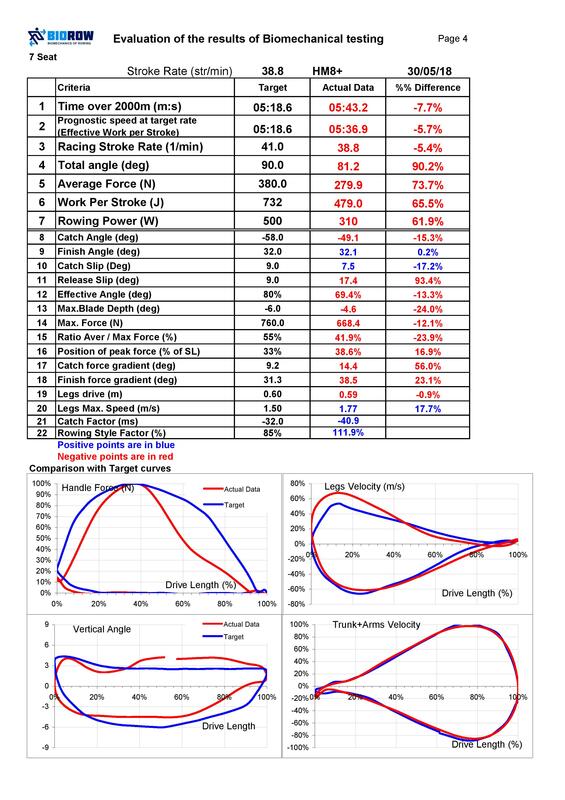 All the data recorded is processed and is set out in a 'report' style document (both for individual athletes as well as a grouped report for a crew), where the numbers and curves are attributed to various features of rowing technique. 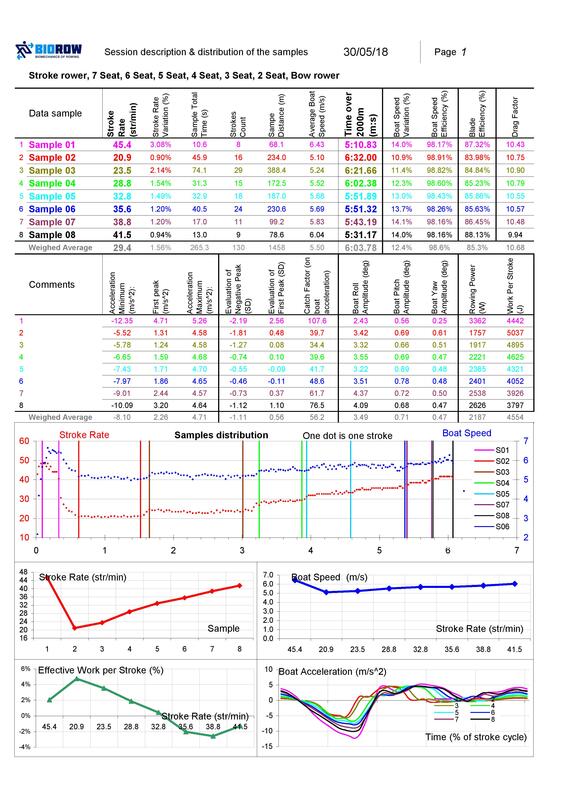 Comparisons are made between the athlete's data and 'target' numbers, to evaluate what the athlete does well and what they can improvem, as well as provide accurate comparisons between athletes in terms of selection. Testing is done by following the BioRow testing procedure: The BioRowTech system is installed by us onto your boat(s). One or more standard pieces are performed, in which the stroke rate is increased over 2km, moving up from 20 spm to max rate. To complete the procedure, you and your crews have the choice of visiting us at our location in the UK. We are based in Slough and have easy access to the River Thames, as well as Dorney Lake, the venue of the rowing events at the London 2012 Olympics. Alternatively, we can travel with our system to your chosen venue and complete the procedure there. Following the procedure, we can provide a feedback session in which we will explain the results of the testing to the rowers and/or coaches, which includes video analysis. You may also choose to use our services thereafter, so we can track your improvement from your last testing. Pricing of the procedure depends on the boat types and amount of boats being tested (larger boats and more boats cost more, but are a better value for money). We can install the system on up to four small-medium boats (1x, 2x, 2-, 4-), or two big (4x, 8+) boats per day, with multiple crews being tested in these boats to make the process more economical for you, e.g. in the past we have worked with univesities where we set up four eights over two days, and were able to test up to 150 rowers. Additional pricing i.e. travel expenses are also required if we come and visit your venue. For larger teams/rowing programmes, it may be worthwhile to purchase the BioRowTel system. We can provide training in the use of the system, so that you can constantly use the system at your own venue. 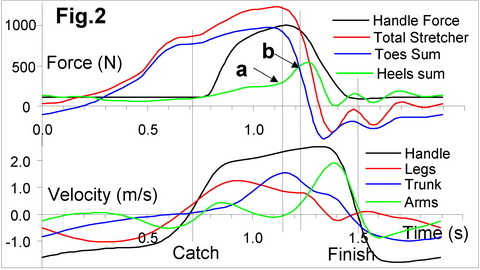 Rowing biomechanics is an interesting field and is constantly growing. As BioRow is a company born out of sport science, it is therefore our pleasure to continue this growth. 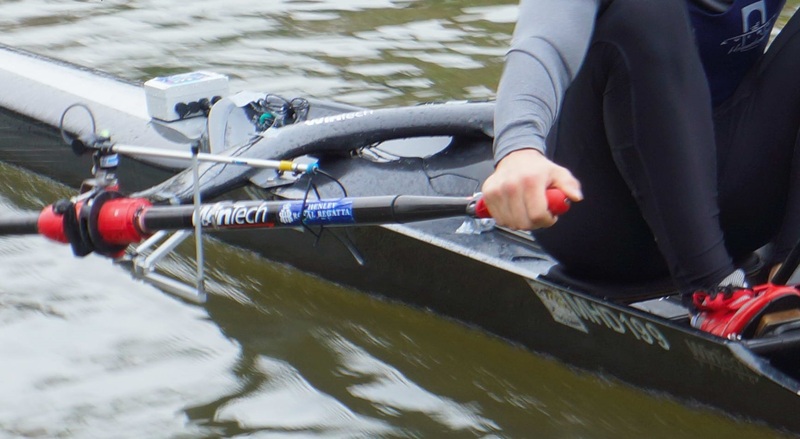 We would be delighted to take part in rowing-related scientific research and use our measurement systems to aid this research - be it an investigation of new rowing technology or a new rowing style. We are happy to work with sport scientists and students to complete this research, and publish papers together. We can also collaborate with rowing equipment manufacturers to investigate whether their equipment is beneficial to rowing performance. Our BioRowTech system can be used to aid this process and accurately determine any speed gains that new boats, oars, shoes etc, may bring. In the past, we have worked with the likes of WinTech, RP3 and Nielsen-Kellerman, and are looking forward to future proposals from other companies to make good use of our knowledge, expertise and technology. BioRow also has a wide range of products available for purchase! You can find them here.